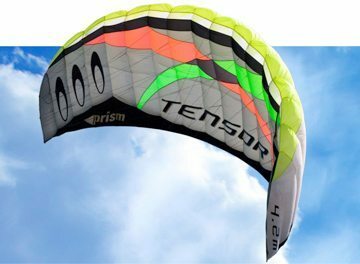 The Tensor 4.2 is our most versatile wing for land-based kite traction and all-around fun, with the widest useful wind range of the three Tensor models. It flies easily in as little as 2mph, produces useable power from about 8mph, and really cranks in 12mph or more. 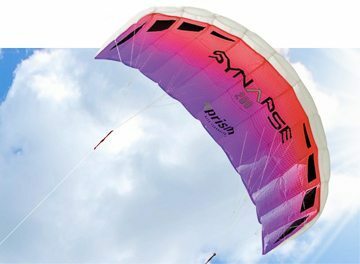 This makes it the ideal choice for most locations if you can only invest in one kite. 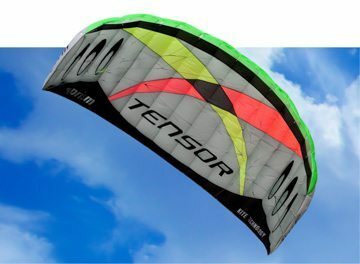 Engineered to be more than just a trainer, the Tensor makes it simple and safe to get into power kiting with a dual-line control bar, safety leash and quick release, all set up and ready to fly. But once you’ve learned basic control, our innovative convertible bar system transforms into rugged quad-line handles for the extra control and maneuverability you need to take on traction sports like buggying, snow kiting and landboarding without spending another dime on your gear. Simply separate the bar at the machined aluminum center joiner and insert the two end fittings to make quad handles. Kite Killers for quadline mode are pre-installed, so just reattach the brakelines and you’re ready to ride. Handles allow sensitive control to generate maximum power from the wind, and can be used with a line between the top ends for use with a harness. 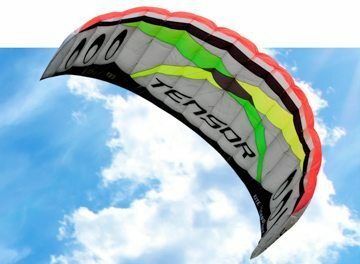 In either mode, the Tensor’s medium aspect wing is powerful but forgiving, with a smooth acceleration that doesn’t bite and confident edge performance without collapsing like high-aspect race kites. 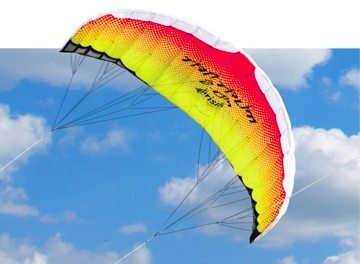 Built to paraglider standards from silicone coated nylon, the wing includes reinforced inlets, dirt-outs to easily remove sand from the cells, and stitched Dyneema bridles to reduce snags and hold optimum wing shape under load. Our Power Trim system allows 3 easy bridle settings to adjust power and performance in different winds. Flying lines are precision-measured and stretched Modulus Spectra for quick response and long life. We also include a stainless ground stake and sheath to secure the kite, and a comprehensive, well-illustrated flight manual that’ll get you up and flying quickly and safely.